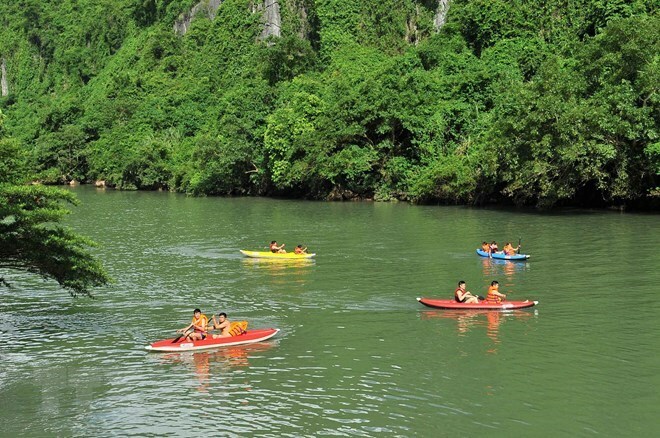 Quang Binh (VNA) – The central province of Quang Binh targets to welcome 4.3 million visitors in 2019, about 250,000-300,000 of them foreigners, and earn some 5 trillion VND (more than 214 million USD) from tourism. Deputy Director of the provincial Department of Tourism Dang Dong Ha said that in order to realise these goals, the tourism sector must continue diversifying and improving the quality of its products and services at popular sites such as the Thien Duong, Phong Nha, and Tien Son caves; Nuoc Mooc spring; the botanical gardens; and Chay River– Toi cave. It will also push to develop a variety of branches, such as marine, resort, adventure, and ecological. The province will continue introducing new tourism products, including festival tours and meeting, incentive, convention, and exhibition (MICE) tourism, as well as promote its strengths in spiritual, cultural, historical, and community-based tourism. Ha said developing tourism must be associated with the protection and preservation of the ecological environment. In 2018, the locality greeted more than 3.9 million visitors, a year-on-year rise of 18.2 percent.